Any day is a good day when I get to play with distressed stamps and papers. The tricycle, the greeting and the papers are all sort of distressed looking. That's a win-win-win! The papers are from the Cosmo Cricket Wanted collection. I just layered a few together to make the background. 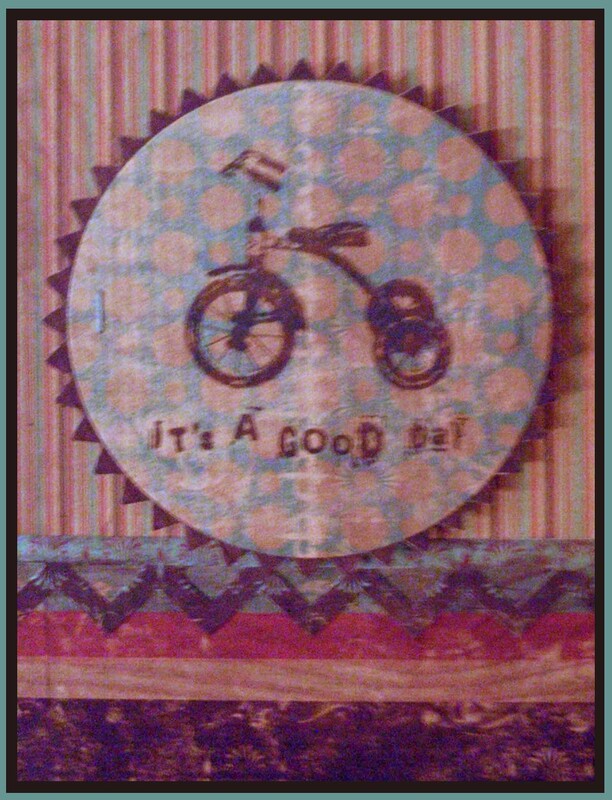 At the seam, I used a border die and to make the focal image I cut a large circle and a scalloped circle mat. By the way, the image is from Unity Stamp Company - one of my favorites. Super quick - and a good masculine card I think. I did cut 2 more circles out of chipboard and placed them behind my image. Even then, it didn't stand out enough, so I used some foam squares and that did the trick. Don't forget to use your dies when you need a quick card. They are handy dandy tools. Tomorrow I am going to show you some of the die cutting machines on the market. I've owned a few different models, so I thought I would share what I know about each.